Caroline Andrew is a psychologist who has worked in private practice for over thirty years. She is currently Co-Director of the International Masterson Institute in Sydney, Australia and is Adjunct Faculty at the West Coast (USA) International Masterson Institute. The International Masterson Institute was originally set up in the USA to provide training for mental health clinicians in the field of “Disorders of the Self” based on the pioneering work of the late James Masterson, MD and Ralph Klein MD. Masterson, who was Emeritus Professor of Psychiatry at the Cornell University Medical School, was also Founder of the American Society for Adolescent Psychiatry. The work of Masterson and Klein had a deep impact on a generation of clinicians, including Kent Hoffman, Ph.D and Bert Powell, who, along with Glen Cooper and Bob Marvin, went on to develop the Circle of Security. Ms. Andrew trained with the late James Masterson MD and continues an ongoing supervisory relationship with Ralph Klein MD, a relationship which has endured for over twenty eight years. She supervises trainee psychiatrists through the Faculty of Adolescent Psychiatry (HETI) in Sydney and has lectured and presented papers on the Masterson/Klein approach to personality disorder internationally through conferences in Asia, Turkey, the USA and South Africa. She has conducted many workshops on this approach in every capital city in Australia. 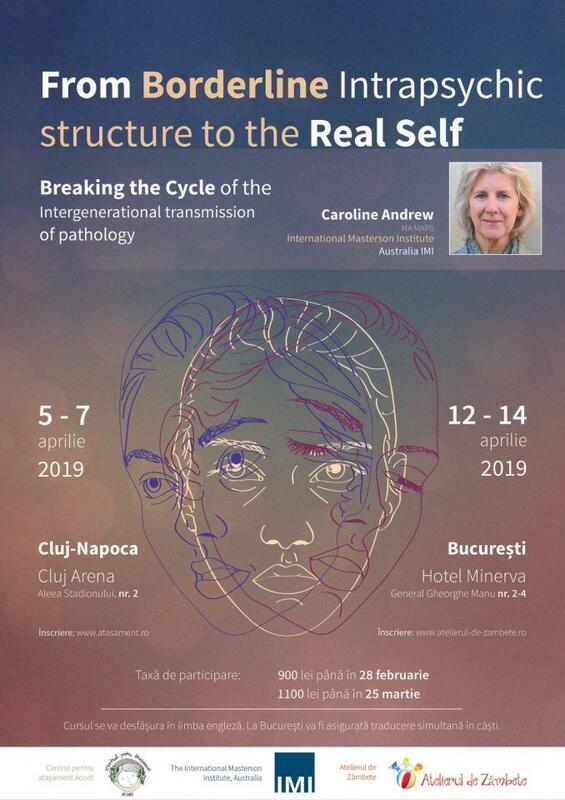 Inca nu a fost adaugat continut media la evenimentul: From Borderline Intrapsychic Structure to the Real Self .